A nearly flawless Spring Break week (weather-wise, anyway…) will close with a nice warmup as temperatures surge into the upper 70s and perhaps the 80s to end March. Changes are coming, though — the transitional season of Spring is not through with us yet. It’s been a rough week here at @chswx HQ with my family being flattened out by a nasty — but mercifully quick-to-recede — flu-ish bug going around. It’s not just my crew at home, either — even the website’s gotten sick. The primary API (application programming interface) I’ve been using to power this site for the better part of a decade, Weather Underground, has finally bit the dust in the wake of The Weather Company’s acquisition by IBM. No excuses on my part — I should have anticipated the threat of this API’s shutdown and worked to be resilient to it — but it is what it is after literally years of speculation over when the API would finally shut down to website operators like me. In a way, this shutdown marks the end of an era. I wrote a lot of the shell scripts and cron jobs that managed the data flow from Weather Underground to this site almost ten years ago, and they have run largely flawlessly for the better part of that time. As it goes, in software development, the only constant is change. So, I’m working on new integrations that pull data more directly from the National Weather Service’s National Digital Forecast Database (NDFD) to furnish forecasts for this site. For you nerds, the National Weather Service itself has begun publishing a rather nice API which takes advantage of modern formats such as GeoJSON. The added benefit of using this API is that the forecast you’re getting is human-generated by expert meteorologists at National Weather Service offices throughout the country, including right here in Charleston. Work on this integration is ongoing and I hope to have everything back up to speed by this weekend. I apologize immensely to all of you for having a broken site this week. I’m putting a lot of work in to make sure that it is reliable and can withstand failure a little more gracefully. Now back to the forecast. 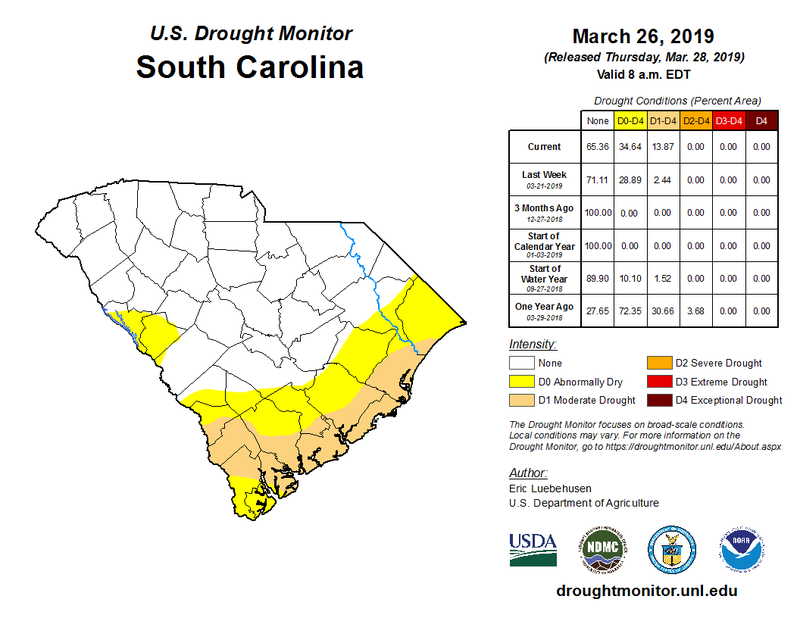 While we’ve been enjoying quite a stretch of nice weather in the Lowcountry, this has come at the cost of increasing drought. Despite the fact that it’s felt like it’s rained just about every weekend this past winter, we’re running about 6-7″ behind where we should be at this point in the year. This has thrust us into the Moderate Drought category with today’s Drought Monitor. Outdoor activities notwithstanding, a good, soaking rain would be useful at this point, and it looks like we might get just that next week. First, though, we’ll get to soak in a couple more days of sun, especially Friday. Ridging aloft and surface high pressure slipping slowly out into the Atlantic will help temperatures get to the mid-70s under mostly sunny skies on Friday. More clouds build into the picture for Saturday ahead of our next storm system, but warm advection from the southwest will send temperatures into the upper 70s, perhaps touching 80. We’ll begin to see a bit more unsettled weather come into the picture for Sunday. Despite increased cloud cover, temperatures should soar into the low 80s ahead of any rainfall. Showers and perhaps a few thunderstorms will roll through during the afternoon and evening hours as the front moves along. (Severe weather doesn’t appear likely.) Temperatures will drop into the 50s behind the front Sunday night into Monday. The cold front that is slated to come through on Sunday is then expected to stall out to our south and east. This stalled front will keep clouds and the potential for precipitation in the forecast for Monday along with much cooler temperatures as high pressure wedges into the area. Winds out of the northeast will be breezy at times, particularly along the coast. We’ll then want to watch a piece of upper-level energy as it digs into Mississippi and Alabama overnight Monday into Tuesday. This should spur the development of a late-season nor’easter that’d track near our neck of the woods sometime Tuesday evening. The big question is where the low tracks — and this is a spot where the main global models are still very far apart on. The positioning of the low will drive everything from temperatures to whether we’ll hear thunder or just get plain rain. All of this should begin to depart on Wednesday, with a warming trend reestablishing itself into next weekend.